The US senate is in a dilemma because every alternative they have thought up to the contentious energy tax has received loud protests from some section of the American public. US PRESIDENT Bill Clinton's efforts to tax energy in order to simultaneously reduce the budgetary deficit and reduce carbon dioxide emissions are running into heavy weather. 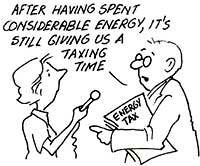 The US senate is now struggling to devise a simple energy tax that will be universally acceptable after strident opposition from various quarters squashed its proposal to tax thermal content of fuels (Down To Earth, March 31, 1993). But the senate finds that every alternative has opponents. Truck drivers and airlines resent a broad tax on gasoline, diesel and airline fuel, while Western states, which depend heavily on motor cars, are against a gasoline levy. And, environmentalists oppose a price-based energy tax because this would encourage use of coal, which is cheap but dirty. A tax based on the heat content of fuel was opposed by people from oil-producing states such as Oklahoma and Texas. Democrat senator John Breaux of Louisiana has mooted an alternative proposal: to tax transportation fuels at 7.3 cents a gallon, rather than all forms of energy. However, such a tax is unlikely to be passed by the US congress as it is unfair to the Western states and the rural areas, where people drive long distances to work. Up in arms Transporters and the airline industry are also up in arms against this levy, as is transportation secretary Federico F Pena, who said Breaux's proposal is an inequitable imposition on already burdened industries, especially the financially troubled airline industry. Members of the Senate finance committee are now trying to broaden Breaux's plan by combining a gas tax with a sales tax on energy, such as electricity. This would be easier to administer, more equitable, and structured to protect US industry from foreign competition.